How did the US abolition of slavery affect the cotton exports? Plantations in Southern US produced cash crops, including cotton. How was the price and output of cotton in the Southern US affected shortly after the abolition of slavery at the end of the American Civil War? I also understand that the textile industry spearheaded the industrial revolution in Britain, and it depended a lot on importing cheap cotton produced by plantations in the new world. If abolition changed the price or output of American cotton, did Britain switch to other sources of cotton, or did it continue importing from the US at the same level? A pdf file THE GROWTH OF THE COTTON INDUSTRY IN AMERICA seems to have some relevant information to the first half of your question. A table, on publication page 73, (pdf pg 3) has some production,export and value figures. 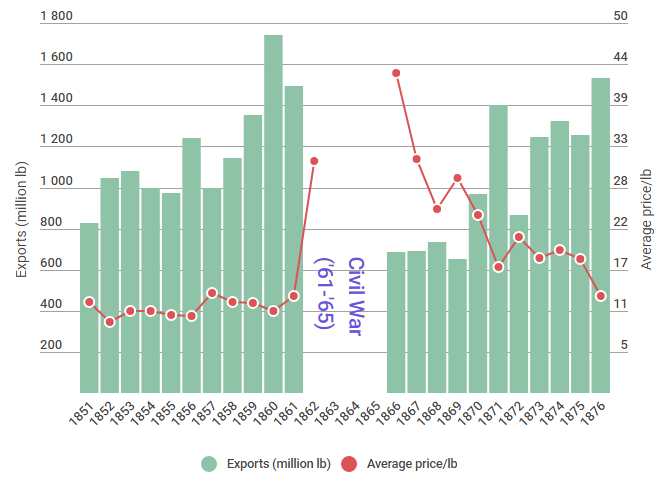 This shows there was a spike in the price of cotton during and after the war, but by 1875 production and export figures were higher, and cost was back down to pre-civil war numbers. During the Civil War, Britain relied heavily on cotton from Egypt and India, which also have a lot of good cotton growing land. After the war, Britain had diversified its sourcing so that it was not as dependent on U.S. cotton. This can be seen in another poster's price chart, which showed cotton prices declining significantly even during the war. The other takeaway from the price chart is that after the civil war, cotton prices returned roughly to prewar levels. So the main effect of "Abolition" on cotton prices was during the war itself (when southern supplies were largely cut off from Europe and prices were an order of magnitude higher), not in the postwar period. Not the answer you're looking for? Browse other questions tagged united-states united-kingdom slavery trade or ask your own question. What was the effect of the Civil War on the cost of cotton? When and how did people begin to consider slavery immoral? Was there a movement for “humane” slavery? Could the UK have ended slavery earlier? If not, why not? Did the increase of slavery in the US bring an end to indentured servitude? Was slavery in the United States legally limited to blacks? What was the first civilization to ban slavery?